From there, most places in town tourists want to see are in walking distance. In addition, it is situated quiet enough. 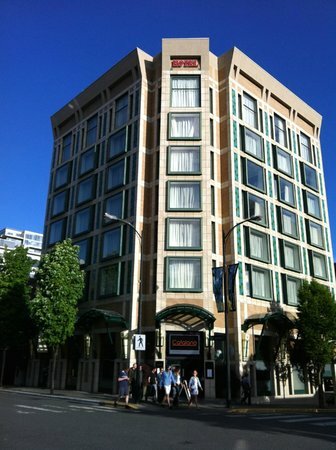 After a complete renovation the Magnolia was reopened in early 2013. For the three of us (couple with adult son) we had the following rooms: Diamond Room City View and Superior Room. Both are well appointed in a traditional style. They are spacious enough and have adequate bathrooms, nothing fancy but all you could wish for even if you are a demanding traveller. There is a spa – as the hotel’s name implies – but we didn’t use it. Neither did we dine in the affiliated restaurant. Continental breakfast was included in our arrangement. It was simple but served the purpose although not being memorable. Service-wise everything was okay. In sum, the Magnolia is your choice if you want to be near the tourist attractions and if you are looking for well-furnished rooms that are luxurious enough to satisfy also discerning travelers and at the same time reasonably priced for the offered.